His efforts paid off and the ambulance reached on time to help the injured person. Every time we order food for delivery, we literally count the minutes to its arrival. And if by some chance, the delivery person arrives even slightly later than the time stipulated, most of us see red. Well, for all such times in the future (because it will happen), you may want to think of this one delivery guy in China who chose to do something more important than making that delivery on time. A post shared on Facebook by People's Daily, China details an incident in which a delivery person helped a lost ambulance reach its destination on time. According to the post, shared earlier today, the incident has gone viral on Chinese social media. The ambulance was on its way to help an injured person on June 4 and met with some difficulty finding the right destination. GPS had also failed them. They stopped to ask for directions and the delivery person, identified as Lu Hucheng decided to help them out. He first helped them with directions but worried that the ambulance may lose its way in the confusing bylanes, volunteered to lead the way. 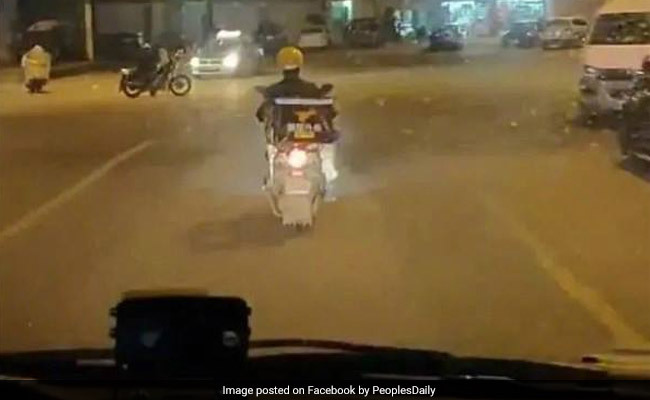 He drove his two-wheeler in front of the ambulance to ensure it reached the right destination. Shang Chaofan, a doctor in China's Zhejiang Province, posted a video of Mr Hucheng leading the way, reports People's Daily, China. His efforts paid off and the ambulance reached on time to help the injured person, who was reportedly in critical condition. Mr Hucheng went about his delivery and even managed to deliver the package in the nick of time. He has since been hailed as hero on Chinese social media according to post. Tell us what you think of the delivery person in the comments section.